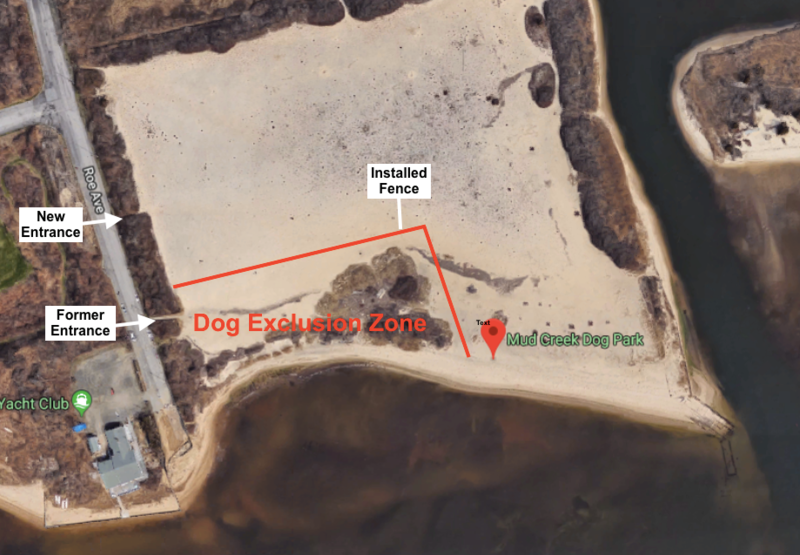 Dog Exclusion Zone Created at Mud Creek–Suffolk’s ONLY Off-Leash Beach! 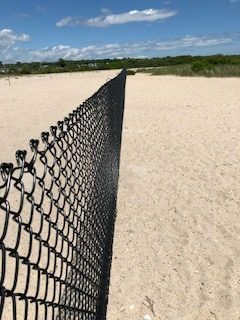 On May 1, 2018, 530 feet of fencing was installed to create a dog exclusion zone at Mud Creek County Park in E. Patchogue—the ONLY official off-leash beach on Long Island! The fencing, which cost $13,000 and cuts the beachfront in half, is the work of Suffolk County Legislator Rob Calarco (D-Patchogue). Leg. Calarco represents the 7th District, which covers Patchogue, Medford and Middle Island among other communities. On June 6th, LI-DOG was invited to sit down with Leg. Calarco to discuss the situation and potential solutions. At that meeting, LI-DOG urged the Legislator to do away with the dog exclusion zone and restore the beach to its original purpose. The off-leash beach at Mud Creek was designated a natural borders dog park in August 2009 as a result of the Five New Dog Parks bill passed unanimously by the Suffolk County Legislature in May 2007. In addition to dividing the beachfront in half, the dog exclusion zone creates a new entry point for dog owners that is further north on Roe Avenue. The new entrance requires dog owners and their dogs to traverse all 530 feet of fence line and sand before being able to access the waterfront. The Mud Creek site formerly was used by the Town of Brookhaven to dump recycled glass and other debris. Broken glass has often been found in this large stretch of sand. In asking for the restoration of the beach to its original purpose, LI-DOG argued the current situation is unsafe, unworkable and unfair. – It is unsafe to make people walk across 530 feet of glass-strewn sand in sandals. – It is unsafe to make pets walk across the sand as glass can cut their paws and the sands gets very hot and will burn their paws. – Installing snow fencing between the chain link fence and the water will create a dangerous situation as dogs will still be able to swim around the fence or dig under the fence into the soft sand thereby separating dogs from their owners with no quick way for owners to help their pets. – The situation is unworkable. Neither the dog exclusion zone nor the off-leash area can be secured without creating a dangerous situation. Yet, on one side you have people who are “uncomfortable around dogs” and on the other side you have off-leash dogs who can’t distinguish the off-leash beach from the exclusion zone. – The situation is unfair to Suffolk County residents. It takes a beach accessible to all Suffolk County residents and closes half of it for use by people who live nearby, thereby creating a “private” beach for a few local residents. Mud Creek belongs to all County residents, not just those who can afford to live a short walk away! – The situation is unfair as it exposes dog owners to steep fines as high as $200 if people complain about dog owners letting their dogs do what the beach was designed for—swim and run off-leash—and Park Rangers are sent to enforce the dog-exclusion zone. – The dog exclusion zone was created in an unfair and undemocratic fashion with no public notice, no public hearings and no input from the people who use the park on this major change in its use. – The dog exclusion zone is a waste of taxpayer money. The county spent $13,000 installing 530 feet of fencing that fails to serve its purpose–allow local residents to walk the beach without coming into contact with off-leash dogs. The zone is too small for walking, it is covered by poison ivy and water at high tide, and it cannot be secured without creating a dangerous situation, noted Janie Dill, a local dog owner who frequents the beach and has written a letter about this issue to Suffolk County Legislator William Lindsay III. Leg. Lindsay represents the 8th District in Islip and serves as Vice Chair of the Legislature’s Parks Committee. The depth of feeling among dog owners about how unworkable and unfair this is is evident in the more than 340 signatures—the biggest component comes from Leg. Calarco’s 7th District—that LI-DOG has gathered on its petition asking for the restoration of the beach. Get the petition to Preserve Mud Creek Off-Leash Beach now! It’s important people understand before the creation of the dog exclusion zone everyone, including nearby residents, had access to the beach, noted Bill Gillis who wrote LI-DOG’s follow up letter to Leg. Calarco after the meeting. Indeed,” we have seen local residents who come to fish, walk and enjoy the beach, most of whom enjoy seeing the dogs playing,” he noted. 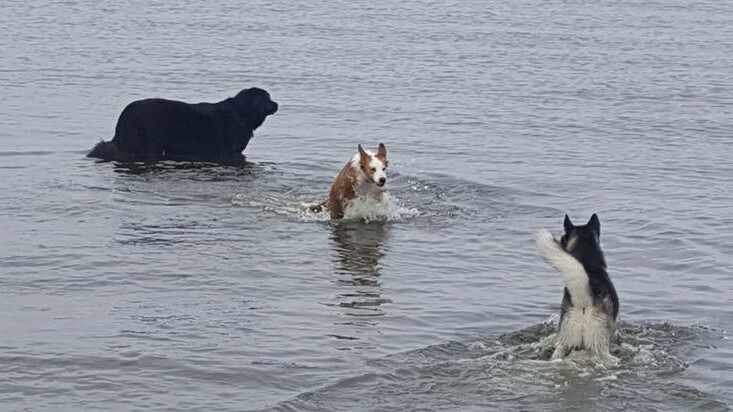 Creating the dog exclusion zone has now actually taken away access for a large number of Suffolk County residents who treasure Mud Creek as their only off-leash dog beach. In response to LI-DOG’s arguments, Leg. Calarco asked that we give the dog exclusion zone “a season…to see if it can work.” If there are complaints, he said, he will “rethink it.” When LI-DOG raised concerns that the longer the dog exclusion zone stays in effect, the more likely conflicts will arise between people in the zone and everyone else, Leg. Calarco vowed he would not seek to eliminate the off-leash beach. – That people be allowed to walk their dogs on-leash through the dog exclusion zone to access the water, thereby avoiding the glass-strewn sand. It’s very important that dog owners let Leg. Calarco know the current situation is unworkable and unfair. Let the Legislator know the benefit of listening to the concerns of hundreds of Suffolk County residents who own dogs and want the beach restored to its original purpose. Let Leg. Calarco know this is a critical issue for dog owners and that support for dog-friendly policies is a key consideration in your support for elected officials. – Preserves the County’s intent to dedicate an off-leash beach for dog owners and their pups at Mud Creek as a result of legislation passed in 2007. – That meets the needs of dog owners for a safe place to let their dogs run and swim off-leash without fear of conflicts with other park users and summonses and fines. By phone at 631-854-1400 (Calls are the easiest, but most powerful way to send a message). Please be polite. By Email at Robert.Calarco@suffolkcountyny.gov. Don’t forget to forward a copy of your email to LI-DOG at news@lidog.org so we can see how we’re doing with our campaign. If you’re a resident of Leg. Calarco’s District 7 make sure Leg. Calarco knows that! If you’re a Suffolk County resident, remind Leg. Calarco Mud Creek is for ALL County residents. Then, help spread the word by getting the Flyer Dog Exclusion Zone Created at Mud Creek. The more support we can show for restoring the off-leash beach, the more likely we’ll get a solution that meets the needs of dog owners!